If you’re going to the wilderness, be sure to wear some flowers in your hair. The group of women gathered under the sign ‘Willow Headresses’ are taking the advice. Like a council of elves, they are weaving their magic into their attire, preparing to float through the Wilderness Festival here in the English countryside an hour from London. To call Wilderness a music festival is to undersell it. Yes, there are stages with music, but that is hardly the focus. At how many other music festivals would you find these women taking an hour out of their day to sit around a pixie-like trailer and make head dresses? Even more unusual, this is just one of about a dozen stands in the crafts section of the event. People are also busy creating things like leather belts, jewellery, painted flowers, wooden board games and bush tools. Wander from the crafts section, past the folk music tent, around the acrobatic rig, and you’ll end up at the ‘sanctuary’, as it’s called. Tents are collected inside a ring of wellness offering massages, yoga, acupuncture and a range of other holistic treatments. Fisherman pants are in abundance and a group of young men nearby are juggling and playing hacky-sack. It’s a world of hippies… if the hippies of today are graphic designers and web developers from East London who need an escape in the countryside. This is no more a lifestyle for these people than a beach holiday in Croatia is, but that’s not a bad thing. This is a festival that is all about forgetting busy lives in a busy city. It relaxes, it entertains and it inspires. One afternoon I wander into the large pavilion where a stage has been set up in the centre for roundhouse-style talks and discussions. Several foreign correspondents are on stage at the moment talking about the current conflict in Gaza and Israel. There are thoughtful questions, poignant answers, and engaging debates. Although I stumbled across this unexpectedly, I stay until the end of the session because I find it so interesting. I look at the schedule and make a mental note to return later in the day for a talk about ‘craftivism’ – not because I had a previous interest in it but because the idea of using craft to effect positive change in the world sounds curious. Of course, there are a couple of large stages for the musical component of the festival and they become the focus in the later part of the day. It’s an eclectic mix of cool and chilled. Burt Bacharach, Joan as Police Woman, London Grammar, Metronomy, Jessie Ware and Sam Smith all top the lineup this year. A smaller party tent for those who want to dance into the early morning seems to have started in the early afternoon. 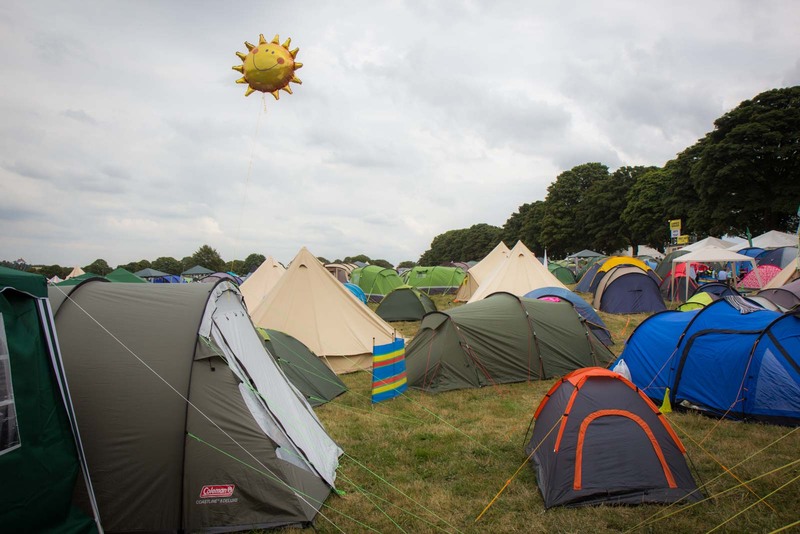 For the four nights of the festival, there is really no accommodation option but to camp. The expansive campsites are spacious but seem to fill up quickly. They are far enough away from the main area of the festival to be quiet… in theory. They are close enough that you can walk back for a rest during the day… in theory. In reality, there is enough to do on the festival site to keep you busy for the whole three days and still feel like you’re constantly missing out on anything. There is a lakeside spa with tubs of hot water and glasses of champagne. In a different part of the lake, there are rowboats and swimming areas. A small waterfall connects the two water bodies. A banquet hall offers meals cooked by top chefs (although these need to be booked in advance) and there are other gastronomical elements with fine dining and fine wining. The night before my Wilderness Festival experience I stayed at the very cool Generator Hostel in London, which set the scene well. The design elements mix with a vibrant social atmosphere to create a great atmosphere for singles or groups. The feeling flows through the weekend. Both the hostel and the festival are part hipster, part hippy, part young professional, part young casual. They’re both cool without being pretentious and welcoming without being overbearing. This is the side of London I love – the modern take on the classic young lifestyle of hostels and festivals. With or without the head dresses. Time Travel Turtle was a guest of Generator Hostel London but the opinions, over-written descriptions and bad jokes are his own. Looks like an interesting and fun experience! It’s good to see that a busy city can have a wilderness festival and be a little less busy! Thanks for sharing!